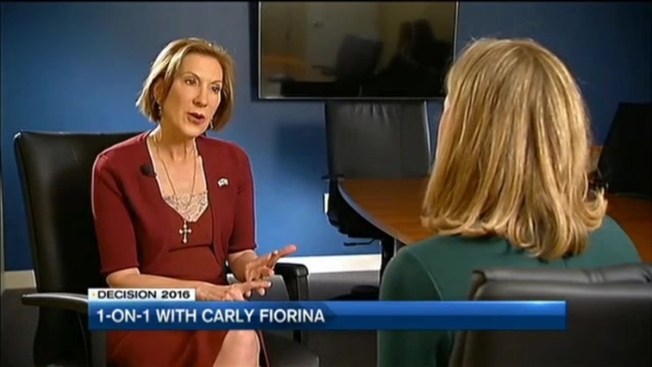 Speaking with necn in New Hampshire Thursday, Carly Fiorina hammered front-runner Donald Trump's controversial plan to ban all Muslims from entering the U.S.
"The reason I think Donald Trump's comments are irresponsible is because it doesn't fix anything," said fellow Republican candidate Carly Fiorina. "So if you ban all Muslims entering the U.S., it doesn't fix how we keep ourselves safe from the people who are already here." Fiorina explained why her own foreign policy experience would be helpful to the country and why her presence in the race forces change in Democrat Hillary Clinton's campaign.